Our experience getting Akiles from Scott & Kandi Washington was a great one. 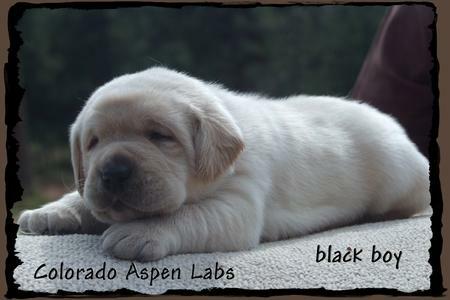 We searched for a long time for the right breeder and found that Colorado Aspen Labs was the best choice we could have made. From the beginning, they were very knowledgeable and answered all the questions we had. We truly have a great quality dog and I would recommend Scott and Kandi's pups to anyone looking for a good family pet. As far as Akiles, he is growing so fast he now weighs 20 lbs. and he is becoming such a beautiful and an intelligent pup. He has become a great addition to our family and we couldn't be happier. We will keep you updated on his growth and progress!!! 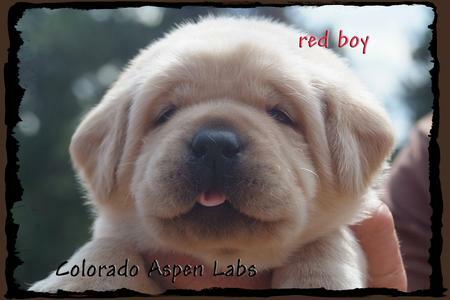 Our experience adopting Jake from Scott and Kandi Washington and Colorado Aspen Labs couldn�t have been better. We looked forward to and loved the pictures and updates of the puppies that Scott and Kandi posted each week on their website. We were able to see how the puppies grew and changed each week, something other breeders don�t provide. They were very professional and friendly and working with them through the adoption process was really more like working with a friend. Jake is so remarkably beautiful and everyone who sees him comments on the quality of his breeding. He is a very sweet and lovable boy and loves to run and play. We love him very much and are very happy with our new member of the family. I highly recommend adopting a puppy from Scott and Kandi. It has been a wonderful and exciting experience from the very start and we would definitely adopt from them again. We wanted to take a minute and let you know how much we are enjoying Goose. 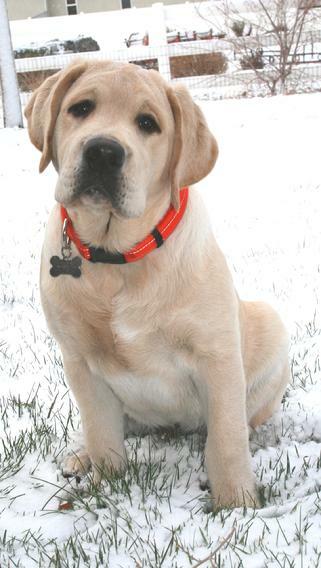 As you know, he is our third yellow lab and he is a combination of all our favorite traits. He is great with the kids, even when they are not so great with him. You may remember how concerned we were with not getting a hyper dog and he certainly is not. One of the most common comments we get when we take him somewhere, other than he is so cute, is he is so mellow and well behaved. Goose is definitely smart as a whip and lets us know whenever he needs something. We had him in for his last shot yesterday and he is 41 lbs. While we all would like to hold and carry him everywhere that time has seemed to come and gone. Finally, we get asked all the time where we got him and we always share your name and website (most people actually write it down). 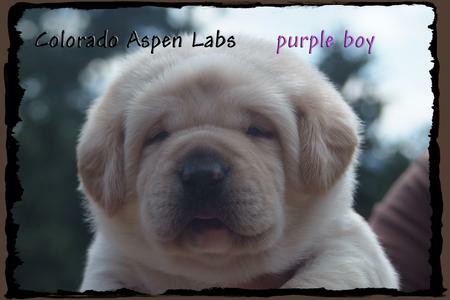 We would never hesitate to recommend you and Colorado Aspen Labs. 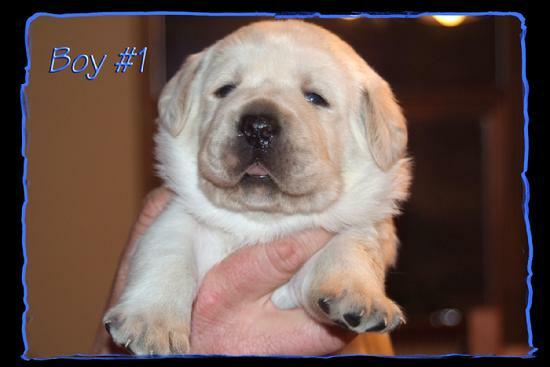 We are excited about picking out our next puppy in January. We will bring Goose along for you to see him. Just wanted to give you a quick update on Ryder. He is weighing in at 50 lbs. Sometimes I think we should have named him dozer since he thinks he can walk though anything. He is a wonderful pup and we could not have asked for anything more. Very smart not so coordinated. Never the less we love him with all our hearts. These pictures were taken last weekend. 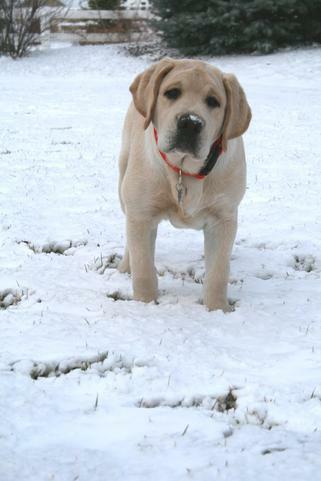 We didn't get to much snow but the little we had Ryder loved.